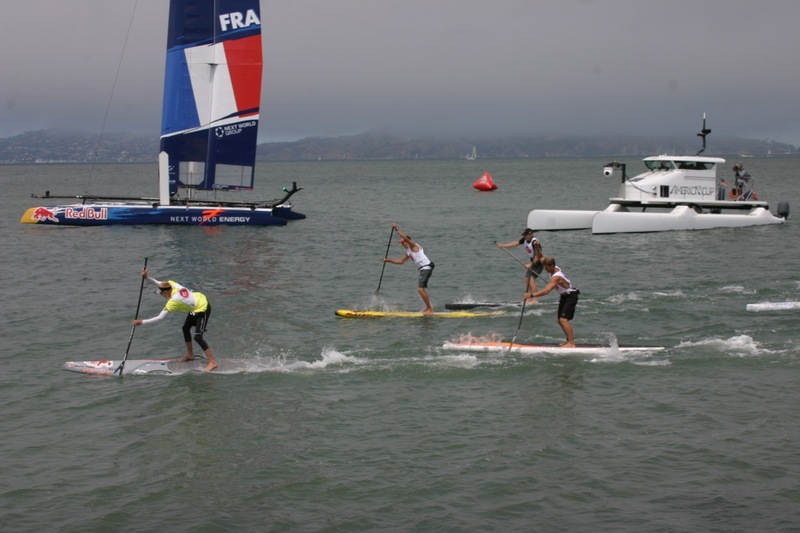 The 2013 San Francisco America’s Cup Open was a great event. It was held at Marina Green and the event site was called the America’s Cup Village. It was right where the 45’s were racing for the Youth Cup. The Golden Gate Bridge was only a couple miles away to the west. With the fog rolling in it was sometimes covered and not visible. There were loads of boats in the bay watching all the 45’s racing. Action packed weekend. There were hundreds of spectators lining the bleachers and waterfront. Big screen televisions around the AC Village captured the action of the 45’s racing, as well as our Standup Races. 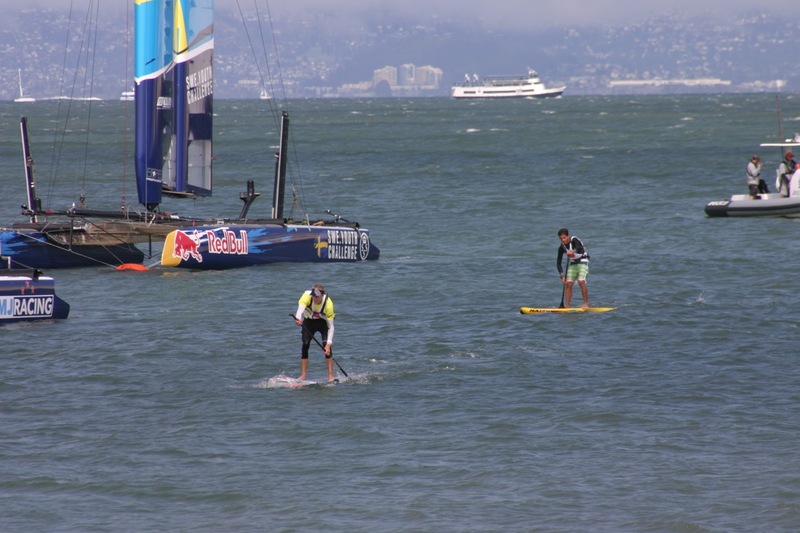 Really awesome to see all the excitement around the America’s Cup. Outrageous to be included as one of the events here at the AC Open!!! On Friday we headed up to the city for a scavenger hunt organized by the Standup World Series. It took us all over the city. Up and down the hills. Following clues. Zane and I were on one team and had fun figuring out where to go. Asking people for help. Four hours later we had finished the hunt. We were starving!! On Saturday, the first day of racing, they ran the long distance. The race was about 7 miles. We started at the end of the marina and headed downwind to a buoy. We were in between the 45′ racing cats and the waterfront. Really cool backdrop for the spectators. 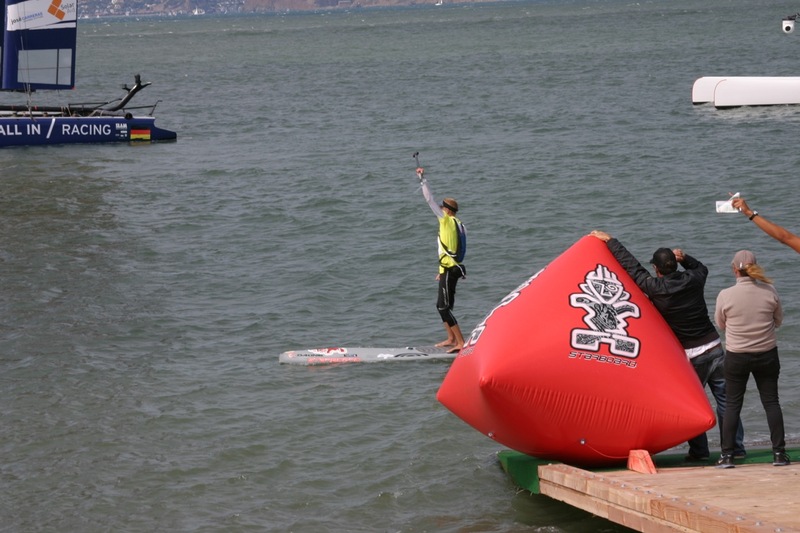 After rounding the buoy we had to paddle straight upwind a couple miles going to the Golden Gate Bridge. The wind was about 20-25 mph. Luckily we had the current going with us. Then we had to round the South Tower of the bridge, which was crazy because there was a lot of water moving, big swells and the current was super strong going out. Kai and I were neck and neck rounding the tower with Mo right behind us. As I was turning around it, I fell into the water and the current was so strong it sucked me back out past the tower. This allowed Kai and Mo to make a huge gap on me. After I rounded the tower it was a straight downwind run, but into about 1-2 knots of current. So I took it to my advantage and put my head down to try to catch up to Kai and Mo. After catching a bunch of bumps I caught up to Mo. I stayed next to him for a bit and then started to pull away from him. I also had closed the huge gap Kai had on me. At this point I thought he had already won but I wanted to catch up so he didn’t have a huge lead on me. So I kept paddling as hard as possible and coming into the Marina Green, Kai had about a 16 second lead on me. Now we had to head back down to the last buoy in-between the 45’s and the spectators on the waterfront. At this point I had already caught up alot and all of a sudden Kai messed up at the buoy so I took my chance and caught up even more. After I turned the buoy I was only a little ways behind, so I put my head down and turned on the jets. I caught up to him and then started to pass him. I kept paddling as hard as I could and crossed the line in first place. I was super stoked to be able to make up that kind of ground and actually win. I got a good home cooked meal in me and rested up for the next day of sprint races. I showed up to the beach on Sunday ready to go and ready for another day of hard paddling. There were not that many people doing the sprint races so there were only three races to do. In my first heat I had Jim Spithill – skipper of the Oracle for the America’s Cup. He and Shannon Falcone, one of the grinders on the boat, both were at the event ready to compete. 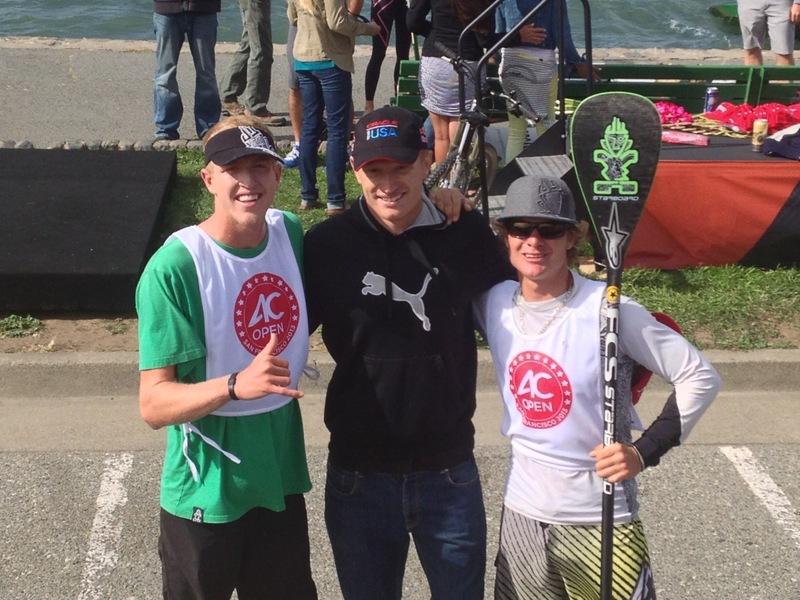 How cool to have such celebrities at this event competing and supporting SUP! My first heat was harder then normal and I had to work it to make it to the semi finals. Only 2 people advanced and I came in second which put me in the the semi finals. I stayed warm got some water in me and got ready to do it again. For the semi finals there were more people but this time 3 people made it to the finals. 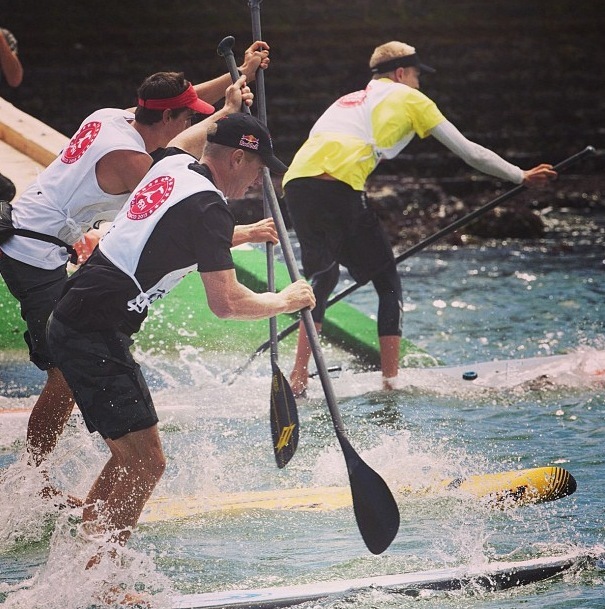 So I made sure to paddle as hard as I needed to make it in the finals. I went around the course playing it safe and conserving energy and made it to the finals. This next heat was the one that counted, the finals, so I put everything I had toward this last race. Coming into the first buoy Kai caught a little boat wake and it gave him a clean buoy turn where Zane, Mo and I all got hung up at the buoy. This allowed Kai to pull away and get a comfortable lead on us. I kept paddling as hard as I could but it wasn’t enough to catch up. I ended up second. So, this placing got Kai and me in a tie, which wasn’t on my agenda, but there Kai and I were again on that starting line. We had to have one more race to break our tie and to crown the overall champion. I put my game face on and was ready to win. When that horn blew I hit the turbo boost and was out of there. From that moment on I held the lead, which got me that 1st place overall. 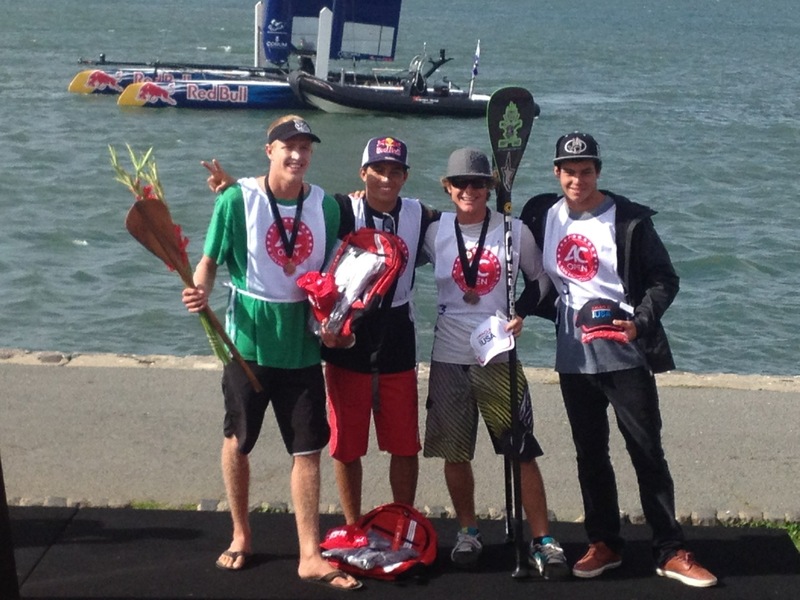 I was super stoked and honored to be apart of the AC Open and to take the win. It was a fun weekend and great racing. 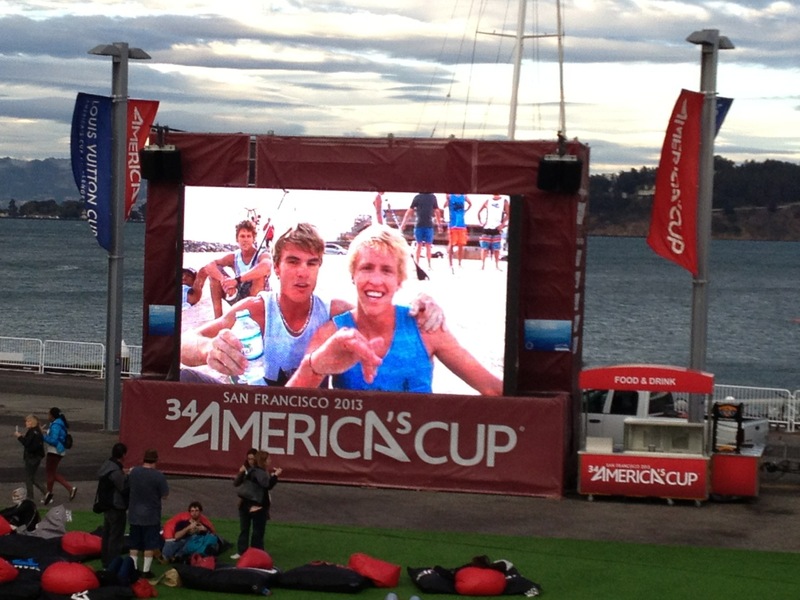 That evening we went to the Main America’s Cup Park – where the Starboard Movie premiered on a huge screen. Loads of spectators – lots of fun – a great ending to a fantastic day. I want to thank my sponsors for all their support – Starboard, Maui Jim Sunglasses, Rainbow Sandals, Futures Fins, Dakine, Trident Sports, GoPro, OnIt Pro, Waterman’s Sunscreen, Igloo Coolers, Sunrite Maui, Hammer Nutrition, iDcard, EFX and Hi-Tech Sports. Also a big Mahalo to all the event organizers and volunteers. Great Event!! Hope to be back in SAn Francisco next year!! My first heat with Jim Spithill in the foreground and Kody next to him. Me in front in the yellow jersey. Look at Jim Spithill – he is using my signature “Choke Grip” – pretty cool! Photos below from my mom!